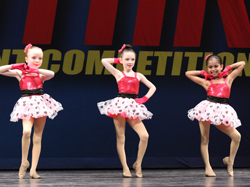 The Connection Dance Team’s (TCDT) mission is to build well-rounded dancers and encourage team building in a safe, fun and competitive environment. TCDT dancers are selected by audition in mid June each year. The 2018-2019 season team is made up of six levels of dancers ages 5 and up. In addition, members have the opportunity to compete in solos, duets, and trios, and to be a part of our Acro and Elite Teams.